Home » DIY And Crafts » Do You Want A Little Cream And Dirt In That? Do You Want A Little Cream And Dirt In That? I was holding out on you yesterday. I found something else at the thrift store. A cute, yet lonely china creamer. No sugar bowl or matching pieces in site. For less than a dollar I couldn’t leave it to languish on the shelf by itself, so I went ahead and bought it thinking there has to be something I can make with this. But what? I’ve seen people make bird houses out of teapots on Pinterest, but this is pretty darn small for a bird to call home. What about a planter? Not mind boggling, but still, it might be cute. So, off I went to Wally World looking for succulents. I had seen Marcy at AntiqueChase plant some in some silver pieces and have had that tucked away in the dark recesses of my mind for a while. But alas, Wally World didn’t have any succulents. That sucked! This nondescript green plant will have to do. Have you seen any cool gardening projects recently? Other than my totally inspiring china planter, I mean. For all you Facebookers out there, I found a neat page on Facebook called Flea Market Gardening that is full of fun ideas and photos. Hope you have a wonderful weekend filled with lots of great weather and tons of time for thrifting and crafting and hugging your kids! Me? I’ll be cleaning and doing laundry. Unfortunately, this house doesn’t clean itself. Really cute Pam ! A very good use for odd pieces. Very nice. I’m glad it found a special home and special purpose. Happy Friday! I was looking at some catcus at Home Depot thinking of planting them in some of my ‘onlies’…this looks so cute! This is really darling Pam!! I like it! This is just the kind of thing that resonates with me. It is so fun to find beautiful, old pieces and think of new uses for them. I have a wonderful, lidless cut glass sugar bowl that holds bracelets, a tiered dish that earrings sit on and teacups that hold small office supplies. Don’t buy new, soulless pieces, look for things that have beauty and NEW function. Good thinkin’ Lincoln. 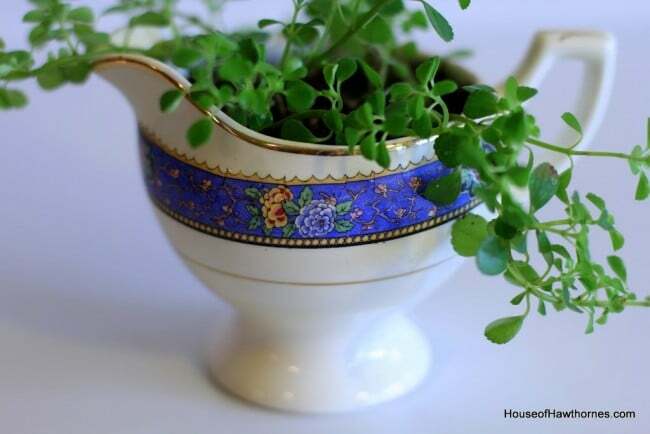 The pretty china creamer made the perfect vessel for your little plant. LOVELY. GREAT idea. I think that is so sweet and dainty. I think your plant might be a Baby Tears. Maybe you might want to look it up and check!! It is so cute! I love that you gave this little creamer a new responsibility. What a delightful way to show off this pretty little thing and give life to something green. You mean you don’t have a housekeeper, Pam?? Ha, Ha! I know exactly where you’re coming from Friend. 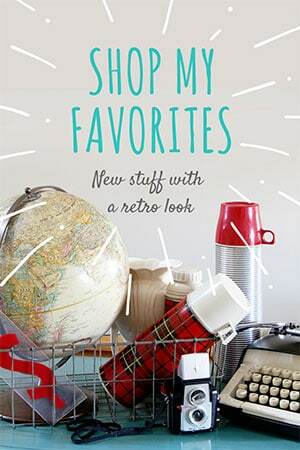 I love all your finds! There has been a dry spell here. Ok, now I want to go to the thrift shop tomorrow 🙂 TY, for talking me into it! You don’t have to twist my arm. Cute creamer! I love the green against the blue…my favorite color combo! It’s charming, Pam! And if you ever figure out that house cleaning itself thing…sign me up! Love it! Bet it looks really sweet sitting in the sun. Ooh, I love this look, Pam. I have some large pots on my front porch, which I planted some impatients in. Unfortunately, the plants just aren’t growing as nicely as I would like, so I stuck in some broken plates, cups and forks. Believe it or not, the china adds a touch of whimsy to those sad flowers! You can always use variegated ivy too Pam. I have a huge pot of it and root it and stick it all over the place. My big pot lives outside all year and realize you cannot do that but still you can do ivy inside. Always such unique ideas! Love it. 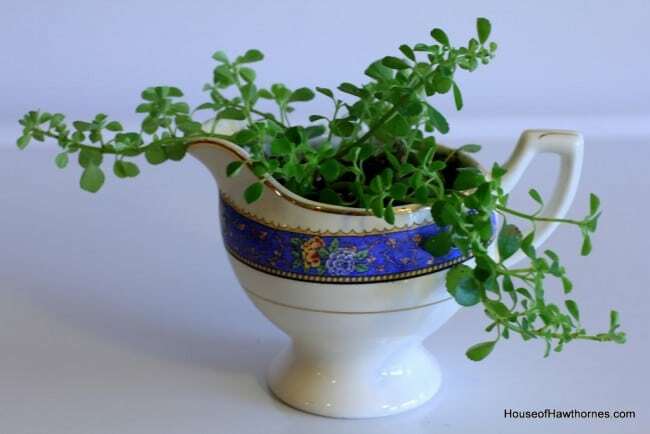 I have the very same little plant in our breakfast nook, and I just love it! So cute and it seems to be very hardy! gotta love that! These look great in smaller “pots” 😉 great use for a single pretty creamer. I think your miniature garden is just perfect!!! I don’t blame you at all for picking up such a sweet little creamer! Nice idea. I see these at the thrift shop all the time. I would never buy a china creamer for myself. I prefer the glass ones. but these would be nice for re-potting small plants for my boutique flower shop. They would look lovely sitting on a cake stand or a pretty tray. Hi Pam! Thanks for visiting bees knees bungalow. Glad you found me. I love the succulent in the creamer! This would be darling at my desk at work. Thanks for the inspiration! Hope you are ok out there in the Midwest Pam. Been watching the news on the tornado and was thinking of you. I don’t know if you are anywhere near this disaster but hope you are well ok!!! 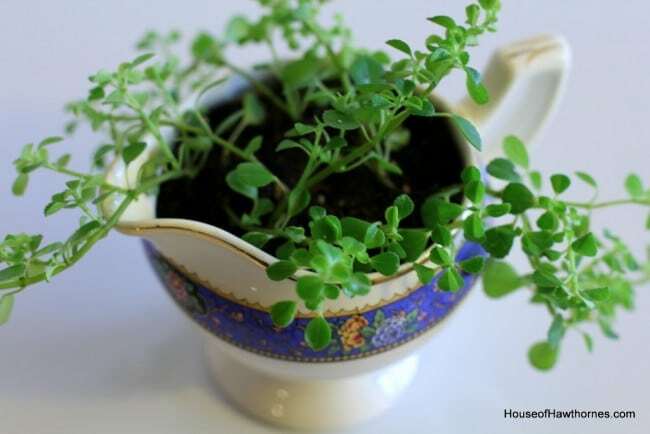 My daughter and I planted succulents in old cups and such for her wedding centerpieces last year, but this little plant is sooo sweet in your creamer! So sweet- the greenery just pops in that creamer! Very sweet Pam! 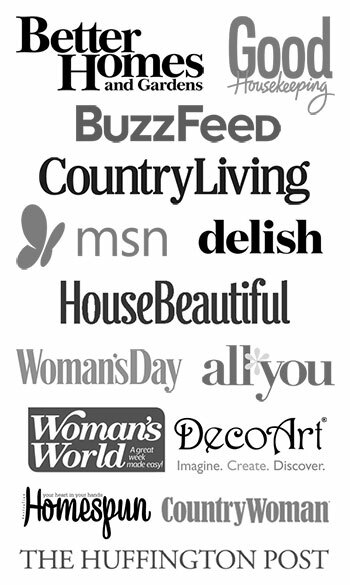 I’d love to see this at our Be Inspired link party if you care to share.